Glebe boss, Jason Wilmont (centre) will lead his side to Windsor Park.INBM46-14 039SC. It was the dream draw everyone at Glebe Rangers was hoping for when they were paired with Linfield in the JBE League Cup. Team officials, players and management were travelling back from their 3-0 away to Queens in the league when the cup draw was made on the radio starting feverish preparations and planning for what is the biggest game in the club’s history to-date. Club Treasurer John McAuley commented: “It is the draw we have wanted every time we are in a draw against the senior clubs. The Blues is the one we have always wanted. “We played Glentoran in 2004 and they beat us 11-0. We were still in the Ballymena league at that time and every since we have always wanted to get Linfield. “On Saturday when the draw was made we were hoping and keeping our fingers crossed and when we got Linfield everyone was over the moon and absolutely buzzing. “It has put the cap on what has been a great start to the season and it’s great for the players and management who have worked hard from the end of last season. “For the lads to get playing at Windsor and for the supporters to go there and watch the Glebe play is brilliant, its all about the experience. “We are already putting plans in place for a supporters bus and we have had several calls with new sponsors wanting to come on board which is great news. “For me as Treasurer I also have to look at the finnancial gain but we aren’t really sure what to expect. However, on the supporters forum there are some Linfield fans suggestion that there could be a huge crowd which would be fantastic for us as a club. 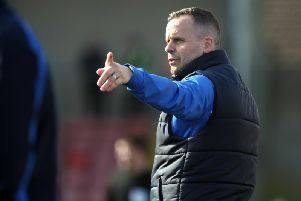 Captain Willie Beckett added: “ After earning a terrific three points away to Queens on Saturday everyone connected to the club quickly turned their attention to the outcome of the league cup draw. “When we heard that we will be visiting Windsor Park to take on giants Linfield, the buzz was incredible. If anyone would like to travel to Belfast to support Glebe Rangers against Linfield on Tuesday 1st September there will be a supporters bus leaving the Manor Hotel at 6.15pm (Details to be confirmed). If you are interested in going or sponsoring the team please contact treasurer John McAuley as soon as possible on 07736474848 or leave a message on the club’s facebook page. Meanwhile, Coleraine will host Ballyclare Comrades in the League Cup on the same night. In Saturday’s draw the Bannsiders were paired with the Championship 1 outfit for the second round tie. All ties will kick off at 7.45pm on the night.